I called this blog ’Lessons I Learned’, but really it would be better titled ’Lessons I’m Learning’. I believe in sharing what we learn to help others avoid our same mistakes and also exposing ourselves to the criticism and questions which might help us improve. I am skeptical of the popular approaches to both voluntourism and development work, though those are both areas in which I have worked as I’d love to be part of learning how we can do them both better. I think we need to learn before we can help, so I believe “service learning” should be “learning service”. I feel like I am learning more every day about how to help create the world I want to see my future kids and their future kids living in, and sometimes what I learn contradicts what I thought I knew was true. I have learned that good intentions are not enough and that the only person you can “improve” in the world is yourself, so I had better start improving the world by starting there. I hope the dialogue generated through this site will give me more chances to do that and to share the lessons I am learning with others who could benefit from avoiding my mistakes. I’ve heard the term to be “whisked off your feet” but I’ve never considered “a whisk” as a noun, apart from the mixing tool in the kitchen, of course. When my husband bought us surprise tickets to Istanbul for the weekend as a gift for my birthday, a friend referred to it as “a whisk,” and indeed, off my feet I am. With less than 40 hours on the ground in Turkey, and the need to sleep for at least some of that in order to be awake for work tomorrow, our time was limited, yet it certainly did feel like a worthwhile adventure: the history and religious mix of the Hagia Sophia, the call to prayer and visits to a range of mosques culminating with the magnificent Süleymaniye Mosque looking over the port, a ferry over to the Asian side of the city for an exceptional meal with an old friend and her new baby, a look at the upside-down head of Medusa in the Basilica Cistern which used to be part of a working network of cisterns housing enough water to serve the city – of about a million people at the time – for a whole year if under siege, a look at the modern city of over 14 million from a rooftop bar with the lights of the mosques and their Ramadan signs lighting the sky, the spice bazaar and grand bazaar (No, we didn’t buy a rug, but we were certainly tempted! But we do now have a lot of yummy tea! ), a taste of famous pudding (our chosen establishment boasted being open since 1867), a walk over the Bosphorus with dozens of fisherman lining the walk, and of course, as no visit to Istanbul is complete without it, a scrub down by a Turkish lady in a 16th-century Ottoman-style bath house. And that was all yesterday….. today, we slept in a bit, had a quick meal, and are now already on our flight home. I feel “whisked away”, but my heart and mind feel like they got whipped by this whisk as well. I feel so grateful and lucky to be able to spend a weekend traveling to such an exciting, vibrant, and far away place, and still be back in time to work in a job I enjoy in Oxford on Monday. I feel so lucky to have a husband who planned a series of thoughtful surprises and who goes out of his way to shower me with love while also still holding the bar high to help me be a better me. The confusing part of my feelings of gratitude and love are when they get mixed with feelings of guilt and responsibility – how was it that I got to be so lucky? Is it fair? What responsibilities, or better yet, opportunities, come with this privilege? We found out while we were away that a dear friend of ours, who is 8 months pregnant and was recently diagnosed with cancer will be undergoing expensive and extensive treatments. This morning, as we discussed the news, we saw a couple begging in the street with a sign saying “We’re from Syria. Please help us.” My friend who lives in Istanbul had noted to us that there are hundreds of thousands of Syrians who have poured into the city, more than they can count, and that a homelessness and joblessness problem is bursting at the seams due to this influx of need. I felt torn: I was struck by the juxtaposition of my own feelings as I choose to walk by, head down, torn about giving money to a couple begging on the street, yet eager to give funds and support to a couple at home with a different set of needs. And my sense of joy, love, gratitude, adventure, and privileged sent that into even more of a kitchen whisk whirlwind of thoughts. I’m reminded that my “privilege” is not measured by my bank account, but by the advantages and protection that come with being part of a global network of well-connected people: in fact this trip was an example of that. My husband told me on Thursday that we were flying to Istanbul on Friday, and with one Facebook post we had dozens of recommendations of places to stay, shops to visit, family members to send regards to, and tips to make our adventure more enjoyable. I know that when I hit rough times in my life, that same network will help me out, connecting me to whatever it is that I need next: be it recommendations for a job, a couch to sleep on, or a friendly ear. My reserves in a time of need are actually held within that vast wealth of good-will and love that comes with being connected to a network of support. The question then becomes, how do I use that network in support of those outside of our immediate web? I write about these dichotomies often in my work on volunteer travel – in fact I was recently editing a part of our book on Learning Service that talks about these often unproductive feelings: the sense of burden that can weigh on those who want to “do good in the world” juxtaposed with an ineffective righteousness that is often unduly touted by those of us trying to “fix” other people’s problems. I know guilt is an unproductive driver, and, as the students in the leadership programme I run know, I’m acutely aware of the dangers of letting “shoulds, musts, and have-tos” run your life: I often remind the students I work with that those words are the barriers to choice and self-determination towards productive change. So as I share these thoughts in contemplation, I am doing my best to remove any “shoulds” or self-judgements, and instead just lay them naked in this blog to examine and consider in a hope that in writing them down, I can work through my own thoughts on what I “could” do next. Today my choice was to share my “whisking” and so, there it is. A wonderful whirlwind journey reminding me of the whirlwind of feelings that living as a human in this time of growing disparity of wealth yet increasing interconnectivity can produce. And in my effort to write four blogs this month without self-judgement of how “good” they are, I’m sharing this straight from the plane, with the smell of the hammam’s olive oil soap still lingering and the taste of Turkish delights fresh in my memory. My wish for today is that both couples, the one living on the streets of Istanbul and our friends going into the hospital today, find joy, support from the compassion of strangers and friends, and that I find a way to channel the love and joy of being whisked away into joy for others, far beyond my personal network of Friends. It’s been a while since I’ve really “blogged”. I’ve written “articles” or worked on “papers” – but increasingly over the years since I started this blog, I’ve gotten bogged down in the trap of making the “perfect” the enemy of the “good”. When I was living in Cambodia and working at PEPY we had a monthly newsletter, and I’d often write articles in there about the lessons I was learning. Increasingly, our newsletters got more “professional” and the lessons I was learning more tangential from the target of our work – in other words, it stopped seeming appropriate to have an article from me questioning some aspect of development work next to an article about our development projects, so I needed to find another place to write. There are the beginnings of posts about the meeting timer app my friends and I made, a half-completed website where people can “free their ideas”, an intro to the gratitude journal we published, and so many other nearly done by just not quite there projects. I just checked the folder, and it now has more than 20 blog posts in it, all waiting in blog post purgatory, hoping for an online home some day. And they might get it! Some friends and I have a “monthly resolution club” and this month my resolution is to post four blog posts – to get over myself, to not worry about making anything perfect, to get back to the fun and flow of writing and sending and not really caring what people think about it, and getting some of my train-of-thought pieces out into the world…. So here I go. Freeing myself of the chains of blogging-editing-perfectionism: In process. Posting without obsessive editing: DONE! Does this ‘Nepal’ image make you want to build these children a home? Claire Bennett (of Learning Service) wrote a follow up piece to her first viral article on the Guardian. If this image of “Nepali” kids makes you want to donate to orphanages, look again. 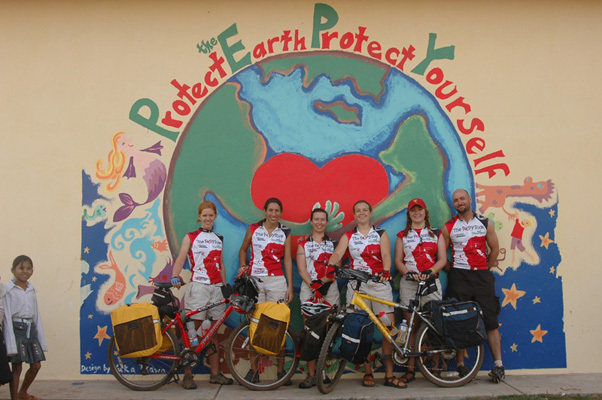 I first laid eyes on my red Specialized Hardrock bike in June 2004, as I prepared to cycle halfway across Japan for a month. You’d think someone who was just weeks away from a multi-week cycle ride would own a bike, but I didn’t, and I had no idea what doors I was about to start opening. 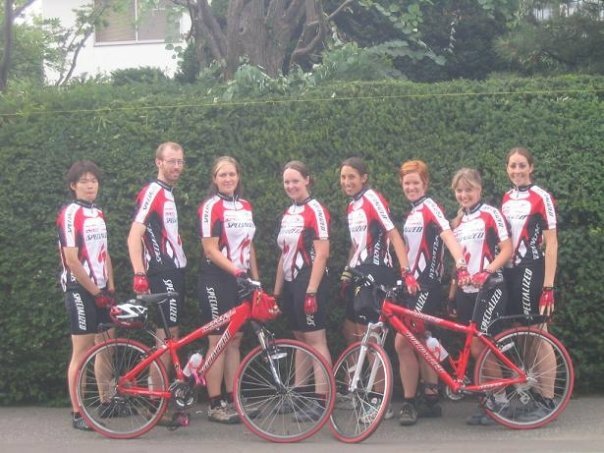 Some of my fellow cyclists on the BEE Ride, an annual environmental education ride across Japan, opted for higher-end bikes with lighter frames, upgraded parts, or fancier Shimano components. For me, the Hardrock was such an upgrade from any bike I’d ever owned, I stuck with the standard offering, solid and sturdy. And sturdy she has been. She carried me across Japan that summer, stopping at Patagonia shops to do talks on the environment, visits to Japanese school and community groups, and a few days at the Sado Island festival for performances by Kodo, the breathtaking Japanese drummers. We had front and back panniers (which I later upgraded to amazing Arkel ones) for of carrying our bike gear as well as food, a sleeping bag, a tent, and all sorts of camping gear. We rarely needed the camping gear though, as each night we’d pull into an onsen, a Japanese hot spring building, which are nearly ubiquitous in towns across the country, and as we were a mixed group of Japanese and foreign riders, we’d attract a lot of attention. It was rare that someone didn’t offer us a place to stay or a meal to eat, with invites to sleep in the tatami rooms of many onsen, to set up our tents on the steps under the awning of the ferry building in the rain, or to eat in someone’s home. Each night, tired, dusty, and proud, we’d go to bed with aching muscles, feeling like we really deserved the food and sleep we indulged in. I was hooked. Why drive or fly across a country when you could see it at a more human pace, gliding through towns, able to stop and chat as you liked, and feeling stronger and more alive with every pedal. I had already had a dream of biking across Cambodia, inspired by other friends who had done the same a few years prior, and the trip across Japan made me determined to plan my next ride. 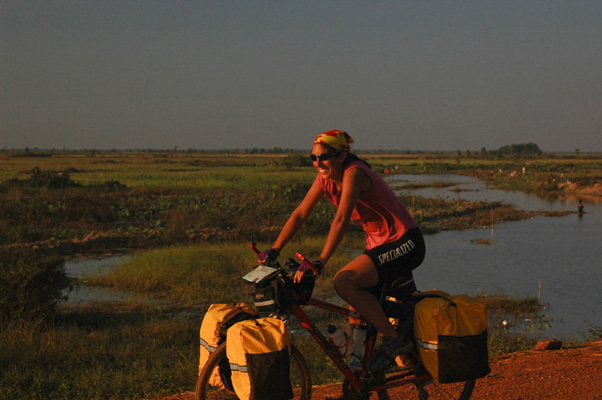 The first PEPY Ride, our annual cycle trip across Cambodia, started in December 2005, and once again, my trusty red steed carried me across the land. This time, the red dust wafted up all around me, camouflaging me and my trusty chariot, and leaving me to pick out dust from my finger nails for weeks afterwards. 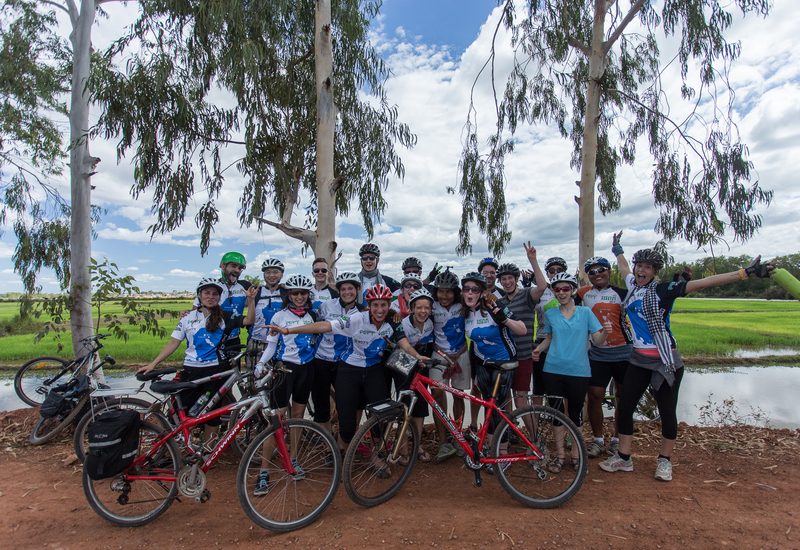 At the time, I didn’t realize our five week journey would lead to many years of living and working in Cambodia, nor could I have imagined that I’d be in Siem Reap again for the 10th annual PEPY Ride recently! And you might not believe this if you ride anything other than a Hardrock, but my bike is going strong. It has ridden across Cambodia many times, and 10 years after I got her, nearly all of her parts are still the original ones from that first ride in Japan. In fact, it took more than 3 years before I even got a flat tire, and the day I mentioned to someone, “My bike has ridden across two countries, one of them three times, and yet had nothing so much as a flat tire yet!” was actually the day I got my first flat. I guess my bike was listening and thought it should try to fit in with the rest of the bikes. It’s only had one other flat in the decade (knock on wood!). In a last minute decision, I decided to bring my lovely Specialized bike to the UK with me after my last bike ride in Cambodia, so here she is now, taking me on my daily commute to work, going strong, and reminding me of all of the friends, fields, and fatigue she has brought me over the years… Anyone up for a bike ride to Paris? A blog post on the Guardian today by Claire Bennett (fellow Learning Service writer). Based on the number of comments, this is a hot topic! Check it out here. I wrote a blog post about leading as “being” – reflecting on the Leading for Impact programme we are running here in Oxford and lessons I have learned through the Clore Social Leadership Programme…. check it out here on the Huffington Post. It’s resolution time! Many of us will set big lofty goals, and once we realize that trying to start a fitness routine, get more sleep, read more books, use less internet, be more present, call our families more, and be kinder to people might be a BIT too much to try to take on at once, many of us will likely drop all of the resolutions at once and give up, on to February without a resolution in site. This past year, some friends and I decided that we were going to try to avoid the resolution overload and set more realistic goals. Inspired by a monthly resolution club we had read about, we decided to start our own. Over the past year, the group has gone through a few iterations of how we hold each other accountable and track our goals, but we settled on this way as the most effective: On the first day of every month we each send an email to the group explaining how well we did on our last goal as well as setting out our resolution for the next month. We’ve found it helpful for people to explain their overarching goal and then the behavior they are committing to for the month to help get them there. For example, one month I wanted to work on an overarching goal of being more present, so I committed to a “No internet after 7:30pm rule” and another month, in line with an overarching goal of health, I decided to give up sugar for the month. This year I have started a meditation practice, drank more water, and worked on not interrupting people so much. My success has varied as some resolutions I have stuck with for many months after my original commitment, and others have faded away or been replaced. One of the best parts of the club has been connecting and reconnecting with friends around the world and hearing how and what others are doing. Some of our group-mates are saving up to purchase a home, working out more, and blogging more, and finding really interesting ways to hold themselves accountable to their own goals. Some of us have used a Tiny Habits approach, with my resolution this month to stretch my back every time I go to the bathroom (inspired by my friend Rithy who has been doing 10 pushups each time he pees!). Hearing stories from others about what has worked, and what hasn’t has been so inspiring and valuable to me, and we have started bi-monthly calls for those group members who are keen to catch up less “virtually”. Through this process, we have helped each other make friends in new towns, support group members who they were going through hard times, and “stolen” each others resolutions when we’ve come across ones that inspire us to improve ourselves in ways we had never thought of before.